Nancy leathem's Trees and Branches: Mr. C. Barwick at the scene of a terrible train crash Hurstville NSW. 1920. 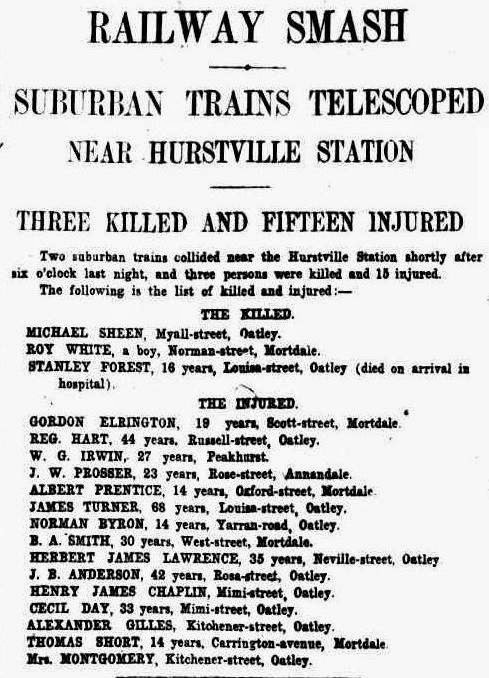 Mr. C. Barwick at the scene of a terrible train crash Hurstville NSW. 1920. "I arrived on the scene within a few minutes of the accident, and assisted in the rescue work. "I helped to chop a number out from the wreckage of the telescoped carriages. One of the passengers had to have his leg chopped off before he could be extricated. "Men were tangled with twisted steel, wood-work, and other parts of the carriage, and It seemed to be impossible to get them out. We were armed with the roughest of implements, and often when about to strike a blow with a tomahawk we would see the limb of some unfortunate person, which prevented us from chopping. Steel had to be cut through with axes and saws. We worked as fast as it was humanly possible to do, but It seemed a dreadful time, and I often despaired of many being rescued in time. "The injured were wonderfully cheerful. One lad, still in his teens, with his leg almost off and with other frightful injuries, asked me for cigarette. An-old man, badly Injured, asked me to get a flask of whisky for him out of one of his pockets. The others were the same, displaying wonderful fortitude." Read how the accident occurred here.